This is a snack beloved by Gujaratis, a sweet and sour shredded spiced potato dish. 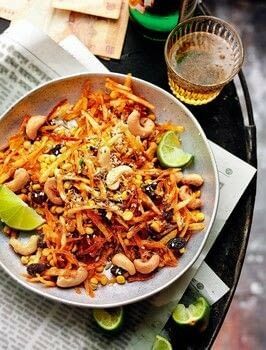 The shredded potatoes are deep fried until crisp, as are the lentils, cashew nuts and peanuts, but plenty of lime juice is sprinkled on just before you start eating so you get this tantalizing mix of crisp bits and soft bits. There’s plenty of chilli in it, sweetness from the raisins and sugar, sharpness from the lime juice, and a good sprinkling of salt too. Perfect balance in street food. © 2019 Rick Stein / Ebury Press · Reproduced with permission. · Rick Stein’s India published by BBC Books, £25. Drain the chana dal and pat dry with kitchen paper. Spread out on a tray lined with a clean tea towel (or more kitchen paper) and leave on one side. Soak the prepared potatoes in salted water for 20 minutes. Drain, use your hands to squeeze out any excess moisture, then pat dry with kitchen paper. Two-thirds fill a large, deep-sided sturdy pan with vegetable oil and place over a medium heat. Test it’s hot enough by dropping in a piece of potato; it should sizzle and turn golden in about 20 seconds. (Or use a deep-fat fryer heated to 180°C.) Deep-fry the potatoes in batches until crisp and golden. Remove with a slotted spoon and drain on kitchen paper. Season with half a teaspoon of salt and set aside. Using the same oil, fry the chana dal in batches for about 3–4 minutes, or until they rise to the surface and turn a shade darker. Drain on kitchen paper, and add to the fried potatoes. Heat a heavy-based frying pan over a low-medium heat. Add the cashew nuts or peanuts and fry for 3–5 minutes, stirring occasionally, until lightly toasted. 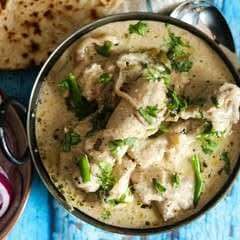 Add the sesame seeds and fennel seeds and cook for 2–3 minutes, stirring all the time. Remove from the heat and stir in the turmeric, followed by the sugar, half a teaspoon of salt, the chillies and the raisins, then mix with the potatoes and lentils. Add plenty of lime juice to give a sweet-sour flavour (you may need to add more sugar and salt at this stage to balance the flavour). Serve at room temperature in small bowls as a snack.